Professor Ferdinand E. Banks (Uppsala University, Sweden), performed his undergraduate studies at Illinois Institute of Technology (electrical engineering) and Roosevelt University (Chicago), graduating with honors in economics. He also attended the University of Maryland and UCLA. He has the MSc from Stockholm University and the PhD from Uppsala University. He has been visiting professor at 5 universities in Australia, 2 universities in France, The Czech University (Prague), Stockholm University, Nanyang Technical University in Singapore, and has held energy economics (guest) professorships in France (Grenoble), Hongkong, and the Asian Institute of Technology (Bangkok). The main portion of his military service was in Japan (infantry) and Germany (artillery), and he was employed for one year in the engineering department of the U.S. Navy at the Great Lakes Naval Training Station (Illinois). He has also been a lecturer in mathematical and development economics in Dakar (Senegal) for 15 months, and macroeconomics at the University of Technology in Lisbon (Portugal) for one term. He was an econometrician for UNCTAD (United Nations Commission on Trade and Development) in Geneva (Switzerland) for 3 years, and fellow of the Reserve Bank of Australia when visiting professor of mathematical economics at the University of New South Wales (Sydney) for one academic year. He was a consultant for the Hudson Institute in Paris, and a systems analyst and applied mathematician for a consulting firm in Chicago. He has published 12 books, including two energy economics textbooks and one book on international finance, and more than 200 articles of various lengths. His new textbook Energy and Economic Theory will be published by World Scientific (Singapore, London and New York) in 2014. He is completing the writing of his 14th book, which consists of non-technical lectures on energy economics. I am going to nominate Freeman Dyson as your Man of the Year. Dyson accepts that anthropogenic (man-made) global warming exists, and even accepts that it is the result of burning fossil fuels such as oil and coal. Transactors in a physical commodity (e.g. buyers and sellers of physical crude oil and natural gas) can employ futures markets to reduce price risk only if other traders and/or speculators are willing to accept this risk. When oil and coal were on the downward slopes of their cumulative production curves – i.e. annual output was declining –natural gas would still be going strong. In Sweden, voters from one of the opposition parties – the ‘Center’ Party – have denounced the dictatorship of the peace loving Swedish majority, and declared that they are ready and willing to make common cause with NATO. Sweden is the perfect country in which to study energy disciplines. Perhaps 45 percent of the electric production capacity in Sweden is accounted for by nuclear, although annually – at various times in the past. I've Heard worse. Some of the opposition parties in Sweden want Sweden in Nato because Putin was nasty in the Ukraine. What it is actually all about in the case of Sweden however is a few persons getting jobs in Brussels. I can add however that going into Nato however will not stop a thousand refugees coming to Sweden every day and 'attacking' my Welfare. Yes, that's terrible isn't it, all those expenses. But stop and Think for a few minutes. One of the dumbest presidents in modern American history, followed by the most ignorant. I Think that the Big PX deserves better, and they can have it if they learn how to vote. Nothing sounds goofier to me than hearing that veterans are going to be taken care of by Mr Obama. All I need to hear now is that George W. Bush is joining the team. Then I'll forget about 16 lost years with Bush and Obama in the command slots, and walk into some recruiting office and offer my services...for the third time..
Did the author of this article really say "...cut the cord from their local Electric utility". And could we get a definition of the "sunny climates" that he is thinking of, because my Power bill is probably going up because of the nuttiness in Germany where solar and wind are scheduled to replace nuclear, which they cannot do, and the Power load in that country will be carried by imports of electricity and coal, to include imports from Sweden. I dont like articles like this because they tell me that although I call myself the leading academic energy Economist in the World, I dont have anything to say about this matter at the present time. At least, not until I have had a good taste of the Swedish summer. 'Solving inequality' (whatever that means) is not - by itself - THE way to improve an economy. although it definitely might help, assuming that things are being done that are conventionally associated with economic growth. I'm talking of course about maximizing the educational output, and ensuring that every drop of technical talent in an economy is discovered, and improved by the right kind of education. Things that were done in the U.S. during the WW2, and which worked brilliantly. This advice is of course directed toward the US president and his team, although he probably knows as much about WW2 as I do about brain surgery. I tell you what: pass it to the next president, assuming that he or she can add and subtract. "Europe's Rising anti-Semitism" you say, which doesn't happen to be true. Interviews with the former lawyer (Lagarde) turned (or appointed) super-duper economic analysis virtuoso. "Undermining U.S. dominated multi-national institutions." And so on and so forth as I occasionally say in my brilliant lectures when I run out of patience..
And why not. We had the tanks, artillery and complete mastery of the skies, and yet they stopped our advance in Korea. I knew then that the worm had turned, although I didn't know why. I know now though, and it's pretty sad. I dont really need any comments because I have all the answers when the issue is nuclear, but let me Point out that a few years ago when I published articles on nuclear, I received comments that reached a new level of stupidity and ignorance. Can it really be that persons are getting the message about nuclear. Well, eventually they will do exactly that, and the sooner the better. And please allow me to repeat: by mid-Century Germany and Japan will probably be the most nuclear intensive countries in the World. The summer of 2008 was Lovely for me, because I was in Paris and in love...with drinking wine outdoors. The price of oil was going into orbit, and predictions were that it would go over 200 dollars. Then of course it started down, and it kept going down until it reached 32 dollars. That was when OPEC gave a demonstration of just what they could do. They had a couple of meetings and the oil price started up again, and did not stop until the price was over 100. We dont hear much about OPEC these Days, but I suspect that they can live with what is taking Place a while longer. At least the countries in the Middle East can. An absolutely important article where I and my work is concerned, however remembering what happened in 2008-09, I wonder how OPEC is going to fit into the present Picture. Maybe I'll try to figure it out if the weather here doesn't get better. 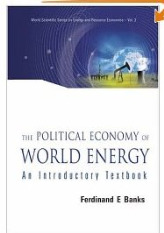 Description: This easy-to-read book presents an elementary yet comprehensive introduction to modern energy economics. Mathematical content is kept to a minimum, and advanced numerical concepts are placed in appendices. The two survey chapters are suitable for readers with little or no formal training in economics. Differing greatly from other energy textbooks, the book aims to provide the reader with an informed advantage. Principally intended as a textbook for undergraduate economics students, it can also be used for self-study or as a reference material. 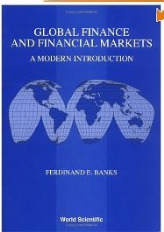 Description: This is an elementary, up-to-date text and reference book in global finance. It has been especially designed for beginning students in economics and finance, and also for self-study by anyone with a knowledge of secondary school algebra and an interest in finance and financial markets. The subjects taken up in some detail are stocks (shares), bonds, interest rates and derivatives, particularly futures, options and swaps. There are also chapters on exchange rates and banking, and readers are provided with an elementary introduction to risk and uncertainty. The book is also an easily read supplement to more technical presentations, in that it introduces all categories of reader to real world financial markets. 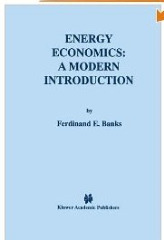 A modern text and reference book on energy economics. It assumes as background only the microeconomic portion of the introductory or first course in economics, and the mathematical requirements can, for the most part, be met by secondary school algebra. The subjects taken up in some detail are: oil, gas, coal, electricity, and energy derivatives - i.e. futures, options, and swaps.